This review article considers two alternative options to standard treatment for desperately ill patients when standard treatments are no longer working: clinical trials and the Food and Drug Administration’s (FDA’s) expanded access program. The article describes the history of drug regulation in the United States, pointing out that the clinical research process to demonstrate safety and efficacy has lengthened the time to market approval. 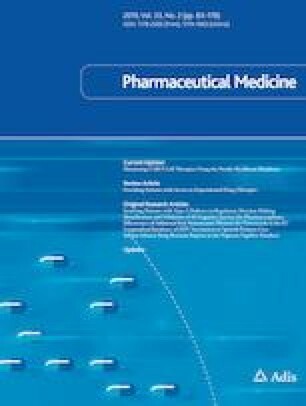 The author describes the advantages and disadvantages of clinical trials and of expanded access primarily for patients, with a discussion of the FDA’s expanded access program, including descriptions of single patient, intermediate-size patient populations and widespread treatment uses. The advantages of the FDA’s expanded access program over the new federal right-to-try law are also discussed. Alternative clinical designs are introduced into consideration as a way to improve the clinical trial process, reduce the time to market approval and perhaps interest more patients in enrolling in trials. Marjorie Speers declares that she has no potential conflicts of interest that might be relevant to the contents of this manuscript. The history of Food and Drug Administration Agency. https://www.fda.gov/AboutFDA/History/default.htm. Accessed 26 Dec 2018. World Health Organization. Clinical trials. https://www.who.int/topics/clinical_trials/en/. Accessed 26 Dec 2018. US Food and Drug Administration. Code of federal regulations Title 21 Subpart I. https://www.accessdata.fda.gov/scripts/cdrh/cfdocs/cfcfr/CFRSearch.cfm?CFRPart=312&showFR=1&subpartNode=21:5.0.1.1.3.9. Accessed 26 Dec 2018. Food and Drug Administration. 2015–2016 FDA global participation in clinical trials report. 2017. https://www.fda.gov/downloads/Drugs/InformationOnDrugs/UCM570195.pdf. Accessed 26 Dec 2018. Rinde M. Patient shortage for cancer trials grow. OncologyLive. 2018;19(9). https://www.onclive.com/publications/oncology-live/2018/vol-19-no-9/patient-shortage-for-cancer-trials-grows Accessed 26 Dec 2018. Food and Drug Administration. Expanded access INDs and protocols 2009 – 2017. https://www.fda.gov/newsevents/publichealthfocus/expandedaccesscompassionateuse/ucm443572.htm. Accessed 26 Dec 2018. Pfizer. Compassionate use and expanded access. https://www.pfizer.com/purpose/medicine-access/compassionate-use. Accessed 26 Dec 2018. Food and Drug Administration. Step 3: clinical research. https://www.fda.gov/forpatients/approvals/drugs/ucm405622.htm. Accessed 26 Dec 2018. US Food and Drug Administration. 21 CFR 812. 62 FR 48947. https://www.accessdata.fda.gov/scripts/cdrh/cfdocs/cfcfr/CFRSearch.cfm?FR=812.36. Accessed 26 Dec 2018. 21 USC 321, 331, 351, 352, 353,355 360bbb,371; 42 USC 262. Subpart I—expanded access to investigational drugs for treatment use. Last updated April 1, 2018. https://www.accessdata.fda.gov/scripts/cdrh/cfdocs/cfcfr/CFRSearch.cfm?CFRPart=312&showFR=1&subpartNode=21:5.0.1.1.3.9. Accessed 26 Dec 2018. US Government Accounting Office. Investigational new drugs FDA has taken steps to improve the expanded access program but should further clarify how adverse events data are used. July 2017. https://www.gao.gov/products/GAO-18-157T. Accessed 26 Dec 2018. US Food and Drug Administration. Expanded access to investigational drugs for treatment use—questions and answers guidance for industry. 2016. https://www.fda.gov/downloads/drugs/guidances/ucm351261.pdf. Accessed 26 Dec 2018. US Food and Drug Administration. Expanded access to investigational drugs for treatment use—questions and answers guidance for industry. 2017. https://www.fda.gov/downloads/drugs/guidances/ucm351261.pdf. Accessed 26 Dec 2018. 21st Century Cures Act, HR 34, 114th Cong, 2015. https://www.congress.gov/bill/114th-congress/house-bill/34. Accessed 26 Dec 2018. US Government Publishing Office. 42 code of federal regulations part 11.28 What constitutes clinical trial registration information? https://www.govinfo.gov/content/pkg/CFR-2016-title42-vol1/pdf/CFR-2016-title42-vol1-part11.pdf. Accessed 27 Feb 2019. US National Library of Medicine, National Institutes of Health. https://clinicaltrials.gov/ct2/home. Accessed 26 Dec 2018. Reagan Udall Foundation for the Food and Drug Administration. http://navigator.reaganudall.org/expanded-access-navigator. Accessed 26 Dec 2018. Patient Protection and Affordable Care Act, 111-147 Public Law, 2010. https://www.healthcare.gov/where-can-i-read-the-affordable-care-act/. Accessed 26 Dec 2018. National Cancer Institute. NCI-COG Pediatric MATCH. https://www.cancer.gov/about-cancer/treatment/clinical-trials/nci-supported/pediatric-match. Accessed 26 Dec 2018. Office of the Federal Register. Adaptive designs for clinical trials of drugs and biologics; draft guidance for industry; availability. 2018. https://www.federalregister.gov/documents/2018/10/01/2018-21314/adaptive-designs-for-clinical-trials-of-drugs-and-biologics-draft-guidance-for-industry-availability. Accessed 26 Dec 2018. US Food and Drug Administration. Single patient expanded access: what you need to know. https://www.fda.gov/ucm/groups/fdagov-public/@fdagov-afda-fda4you/documents/document/ucm504489.pdf. Assessed 27 Feb 2019. US Food and Drug Administration. Subpart I: expanded access to investigational drugs for treatment use. Sec. 312.315 Intermediate-size patient populations. https://www.accessdata.fda.gov/scripts/cdrh/cfdocs/cfcfr/CFRSearch.cfm?fr=312.315. Accessed 27 Feb 2019. US Food and Drug Administration. Subpart I: expanded access to investigational drugs for treatment use. Sec. 312.320 Treatment IND or treatment protocol. https://www.accessdata.fda.gov/scripts/cdrh/cfdocs/cfcfr/CFRSearch.cfm?fr=312.320. Accessed 27 Feb 2019. US Food and Drug Administration. Expanded access INDs and protocols 2009-2017. https://www.fda.gov/newsevents/publichealthfocus/expandedaccesscompassionateuse/ucm443572.htm. Accessed 26 Dec 2018. Clinical Research Pathways. For drugs and biologics: intermediate-size patient populations and widespread treatment. https://clinicalresearchpathways.org/resources-for-expanded-access/intermediate-size-patient-populations/for-drugs-and-biologics/. Accessed 26 Dec 2018. Goldwater Institute. Right to try model legislation. http://goldwaterinstitute.org/wp-content/uploads/cms_page_media/2016/1/5/GoldwaterInstituteRighttoTryModel.pdf. Accessed 26 Dec 2018. Wendler T, Mongiello F, McLinn J, Bellina MS. HR5247: Trickett Wendler, Frank Mongiello, Joran McLinn, and Matthew Bellina Right to Try Act of 2018. https://www.govtrack.us/congress/bills/115/hr5247. Accessed 26 Dec 2018. Keown A. Glioblastoma patient given right to try experimental drug in California. 2019. https://www.biospace.com/article/glioblastoma-patient-given-right-to-try-experimental-drug-in-california. Accessed 18 Mar 2019. Cour E. Only one patient will get access to this experimental ALS therapy before it's approved. 2018. https://www.marketwatch.com/story/only-one-patient-will-get-access-to-this-experimental-als-therapy-before-its-approved-2018-06-26. Accessed 18 Mar 2019. US Food and Drug Administration. Statement from FDA Commissioner Scott Gottlieb, M.D., on new efforts to strengthen FDA’s expanded access program. https://www.fda.gov/NewsEvents/Newsroom/PressAnnouncements/ucm625397.htm. Accessed on 26 Dec 2018. US Food and Drug Administration. Expanded access program report May 2018. https://www.fda.gov/ucm/groups/fdagov-public/@fdagov-afda-gen/documents/document/ucm618903.pdf. Accessed 26 Dec 2018.